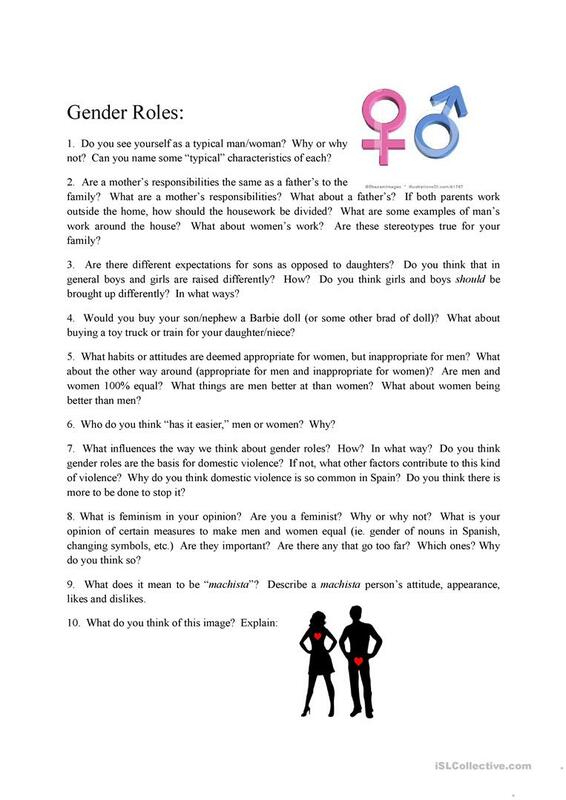 These conversations questions cover the topic of gender roles and gender stereotypes. This downloadable printable is intended for business/professional students, high school students and adults at Pre-intermediate (A2), Intermediate (B1), Upper-intermediate (B2) and Advanced (C1) level. It is valuable for teaching Adjectives in English, and is excellent for strengthening your groups' Speaking and Reading skills. It focuses on the vocabulary topic of People and Women and men, gender roles. vp22 is from/lives in Spain and has been a member of iSLCollective since 2012-12-12 22:53:30. vp22 last logged in on 2017-10-04 21:23:50, and has shared 9 resources on iSLCollective so far.